My neighbour loves chocolate and loves sweets but she gets headaches for days afterwards. I started thinking about this and kept my mind and my eyes open for a solution. I did some testing with organic dates and almonds and came up with these treats. Add dates and almonds to a food processor fitted with a steel blade and process until they come together into a ball. Break up ball and add cocoa powder, natural raspberry flavour vanilla extract and salt. Process until all ingredients have been combined and form into a large sticky ball again. Roll into 20 small balls and dust with cocoa powder. Store in refrigerator for up to 2 weeks. They will store longer in the freezer. My neighbour tried them and did she get a headache? You guessed it! NO! 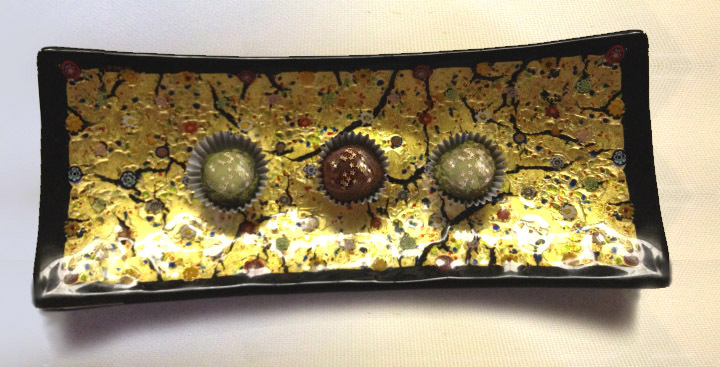 Added pizazz – Sprinkled edible gold leaf on your truffles. Or – add organic lime zest on top of the truffles -right before serving for that extra tang. *Note: Natural raspberry flavour is made by companies such as Boyajian and is available through http://www.goldaskitchen.com and other sources. A few weeks later, I was chatting with my hairdresser about food. She was concerned about the sugar that her adult sons were ingesting and she asked me if I had any recipes for dates and nuts. She had tried to make some sweet treats on her own with limited success. She was chopping the ingredients with a knife. You really will not get that smooth consistency with a knife. A food processor is really ideal for this process. You can change the consistency by adding more lime juice or almond milk. Add dates and almonds to a food processor fitted with a steel blade and process until they come together into a ball. Break up ball and add cocoa powder, matcha powder, almond milk, vanilla extract and pinch salt. Process until all ingredients have been combined and form into a large sticky ball again. 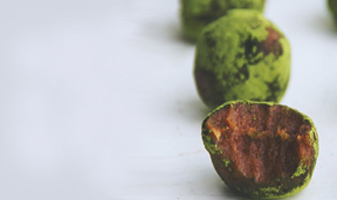 Roll into 20 small balls and dust with more matcha powder. FOOD FACTS: You do not become hypoglycemic with these treats. They do not elevate your blood sugar. Remember with sugary treats, you are full of energy or have the sugar rush. Inevitably, after the peak then comes the crash. These truffle treats have very healthy ingredients; full of nutrition and will also give you a boost if you are working in the office or you are at the gym. You can keep on going like the “Ever Ready Bunny” . 4 organic limes, zest and juice of each. Mix only 1 1/2 cups of the pistachios and all the dates in food processor until it comes to a ball. Reserve 1/2 cup of the pistachios for the coating. Process the pistachios and dates until it comes together in a ball (about 3 minutes). While this is mixing, zest the limes and then juice them. Chop the remaining 1/2 cup pistachios into tiny bits to be used for coating. 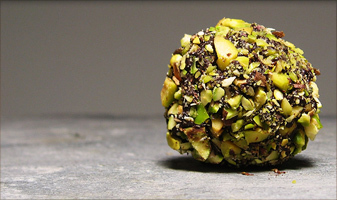 Break up the pistachio-date ball and add zest and juice of all key limes. Process until well combined. Toss pistachio-date mixture into 18 balls and then roll in chopped pistachios. Store in refrigerator for up to 1 month or longer in freezer. FOOD TIP : You can change the consistency of these sweet treats by adding more lime juice or almond milk as needed. Also if you are using the zest of any citrus fruit, you must buy organic to avoid the pesticides. If you are just eating or juicing the lime, you don’t need to pay extra for the organic. Thank you Splendid Eva for creating these superb truffles. They are delicious. Yay! Thanks, Eva! I can’t wait to try these! I have joined your rss feed and stay up for searching for extra off your magnificent post. Thank you! We are adding “Print Recipe” on new blogs and updating the older blogs. If you want to go back and print any of the truffles recipe – it is now available. Greetings! Very useful advice in thius particular post! I am giving little boxes with two truffles inside to my medical providers along with the recipes of course. The little touches do mean a lot! Thank you for your thoughts. This is so exciting. I appreciate your support! Enjoy the treats! I appreciate your comments!